Google+ Cinema Viewfinder: Three's Company; Four's a Crowd? Though Jean comes on a bit brusque initially, we soon learn it is only a defense mechanism used to mask her feelings of loneliness now that her music career is essentially over. The bitter split between her and Reg is only one example of Jean's decision to prioritize music above her personal life. And in her twilight years, it's evident that she has begun to reconsider whether this was the right choice she'd made. Rather than spell it out by assigning Smith some long maudlin speech in which she addresses these feelings directly, Hoffman focuses on subtler instances that underscore Jean's regrets. On her way to first joining Beecham House, we see her practicing a speech to herself, one we'll later learn is an apology to Reg. Later, Cissy introduces Jean to a young girl visiting the retirement home, and only moments later the departing child turns back to Jean and says, "Goodbye... what's your name again?" Jean's silent shock at the question indicates a disbelief that after all these years working diligently to leave some sort of musical legacy, her sacrifice only amounts to a brief moment of glory among her peers and everlasting anonymity to generations who'll follow. Maybe Quartet addresses Hoffman's own feelings concerning the fleetness of fame. The actor-director has always been wary of being too visible in the public eye. In Quartet, he seems to be celebrating the artistry and skill of even the least important musical players, frequently digressing into sweet musical interludes as all of the home's retirees rehearse for their part in the upcoming annual benefit gala under the stern direction of Michael Gambon's flamboyant Cedric ("CEE-dric!"). Even Cedric, though poked fun at, is celebrated for his serious devotion to his work, while Jean is almost ostracized for refusing to share her talent, flawed as age might have left it, with her friends and the gala audience. 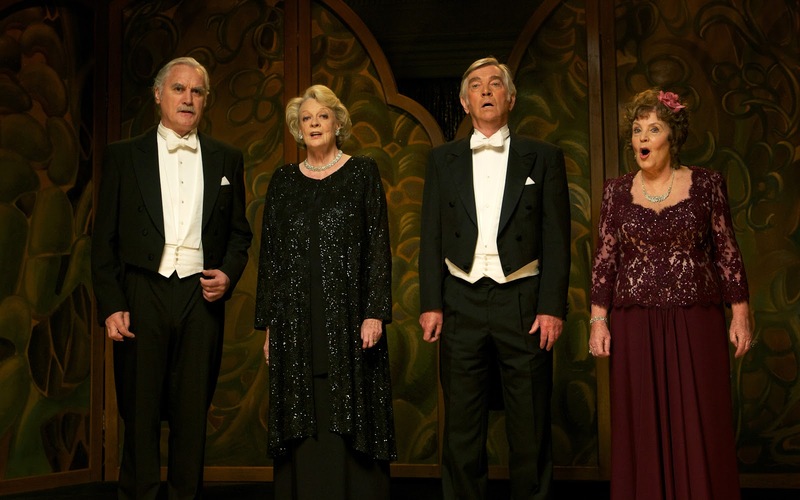 Sure, Quartet glosses over some of the more disheartening reminders of mortality. Cissy's Alzheimer's conveniently goes into remission whenever it doesn't serve the plot machinations or as a bit of comic relief. And one hospitalized patient (Michael Byrne) Jean knows from her salad days only appears long enough to remind Jean that Lust for Life is Important before disappearing from the film, never to be heard of again. But Hoffman relishes every chance he gets to elicit a juicy moment from this fine ensemble of veterans (Tom Courtenay... what's the last time you saw him in a movie?) and it shows. He keeps visual flourishes to a minimum, probably a first for a debuting director, letting his performers and their music get the spotlight. For that reason, if for nothing else, Quartet is a pleasant surprise.